The “wordless” opening gave a very good feel for the start of this episode. I’ve enjoyed how this series has treated its episode openings. Similarly, this post is essentially imageless. Artistic nature? Nope, just laziness. Watching this episode makes me feel as if I’ve missed out on something watching Aria the Animation. It relates to the world that is Aqua. The series has a feel as if it couldn’t exist if it took place on Earth, so in the back of my mind, that was reason enough for it to take place on Mars. I never gave it any thought. Looking back at a lot of the worldbuilding, I still feel there have been too many info-dumps. However, what I failed to realize was that the worldbuilding very well had a purpose to serve: building up the world of Aqua, of its present, its past, its conception. Of its people, its history, and how it came to be. I’ve been watching expecting to see an easy-going series about three Undines and their experiences together. From meeting one another to getting to know one another, from spending time training on the beach to spending time relaxing in a hot spring, from time spent practicing in the canals to time spent collecting chestnuts and digging for potatos. For me, this series seemed to be about these three girls. The world-building was simply something that should be in the background, and the info-dumps. After this episode now, having seeing seen the incomplete Ukijima, the unstable weather, the flashback of Ami, the pioneers watching the water finally flow it, it feels as if the existence of Aqua has flooded in as well. Flowing into the canal with Aqua’s first wave of water is the tale of a world made by man, the story of pioneers who have to build their own wooden deck, and grow their own food. The world of Aqua has steadily been building up as a real world within the series since before Akari delivered that letter that otherwise seemed undeliverable. I have to wonder, did I simply miss something big in the background, or did I push it away whenever it came in the form of a massive info-dump, rather than as something more subtle? Akiko talks about cats binding the past and the future. 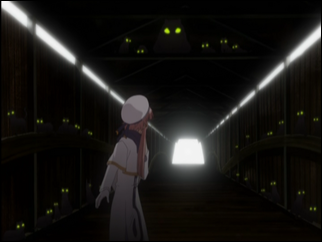 The bridge was full of enough cats to send Akari back in time (including one rather large cat! ), something Akari realized, and it seems even Akiko realized it (perhaps easy enough for her to believe after Akari talked about Aqua being man-made, then seeing the water come in?) Would it be accurate to say the cats on Manhome possess these time-bending abilities, or is this something somehow unique to Aqua? (Does the big cat factor into this in any way?) Did people bring cats to Aqua because of this power back home, or because they discovered a nostalgia brought about by the cats when on Aqua? Considering Akiko and the families of her students are pioneers, essentially pilgrims crossing the skies and travelling through space, I’m left to wonder what life is like for these people. How long did it take to reach Aqua? It’s probably more than possible for them to simply return to Manhome if they realize they are not cut out for life on Aqua, with all its hardships. It seems as if the concept of the pioneers of Aqua could make for a decent animated movie in itself. With years being twice the length of Manhome years, how do the people of Aqua age themselves? Would a 30-year-old from Manhome be referred to as a 15-year-old on Aqua? Or do the people of Aqua have two birthdays a year? Akari arrived at Aqua a year and a half prior, which it seems would be three years in Manhome time. If she arrived during the summer (but after the Acqua Alta), this works out, as this is Akari’s second winter. Although, come to think of it, was Akari familiar or not familiar with the concept of the snow bugs that signal the start of winter? It makes sense for someone visiting “New Venice” to know an Italian word such as “avvenire”. Akiko Hoshino is obviously Japanese (as evidenced by her name) and Akari is Japanese as well. Alicia and the others have Italian, English, and such names, but they all speak the same language. I figure Neo-Venezia has Japanese as its language, but the only real showing of Japanese culture has been at Granny’s place. (In the prior episode, Akari is shown stepping out of her sandals before stepping onto the carpet, so it’s not completely self-contained to Grandma’s episode.) If each island has a different culture from Manhome, it would make sense for Neo-Venezia to go with the Italian culture and lifestyle, and therefore Italian would be their spoken language. Be this the case, it would mean Akari learned Italian fluently before the start of the series, and that she is either less familiar with the word “avvenire”, or that she stopped to think of its meaning in Japanese. I know, I know, pondering on the language is futile. The audience is Japanese, so the dialogue is in Japanese. But what’s the fun in putting it that way? Besides Akiko being another A-name, the Japanese credits list (probably the school kids) Anita (アニータ), Angie (アンジェ), and Alf (アルフ) (someone, hide the cats!) I imagine a list of people who want to move to Aqua, and a buggy computer software that “randomly” picks the first ten or so names from the list to go to Aqua, resulting in a planet of newcomers with A-names. Well, maybe not. I’m wondering myself under what conditions Akari went back in time. Was she actually in the past? When she returned to her own time, did memories of her visit remain, or was she forgotten, as if she had never been there to begin with? If the latter, would Akiko notice that she has less food remaining than she remembered, or would her remaining food stock reflect as if Akari never visited? – Aqua and Neo-Venezia speaks esperanto. Technically speaking the original Aria anime are all dubbed into japanese. In the beginning it was envisioned that all Aria anime cast speak esperanto on-screen and provide kanji subtitles, but this was impossible for lack of enough esperanto seiyuu in Japan and the Aria target audience was considered too young to follow subtitles all the time. Therefore Aria anime became Japanese-speaking and only some of the songs remained esperanto, like Alice-chan’s canzone from the end of Aria the Origination. This is partially regrettable, because the kind of excellent japanese voice acting they put into Aria makes it very difficult to dub the anime into western languages, cutting most if not all changes for TV export. Subtitled DVD exports cannot reach as many people. – I think Akai is 15 earth years old, while Alicia is 19 martian years old (35,5 earth years). I think Akari may be the reincarnation of the lady teacher from 150 years ago, that’s why Caith Sith choose her for the Aria company trainee job, so she would come to Aqua. Caith Sith is probably the former cat Pete. Me thinks “avvenire” is french, not italian. I haven’t see the OVA, so I cannot comment on that. The word avvenire according to Wiktionary is Italian, but I do admit that I didn’t look that up until righ tnow. How far in the past exactly is this episode? Is that a young Aika by the bridge, or is this far enough back where it’s just a descendant or something. In one episode, Aika (I believe) notes that Aria Company has been in business for long time, maybe 100 years or so. If Grandma was the person who established Aria Company, then it was probably at least 50 years ago. Likely the past events of this episode happened at least one hundred years prior, and I would easily believe it could have been longer than that.